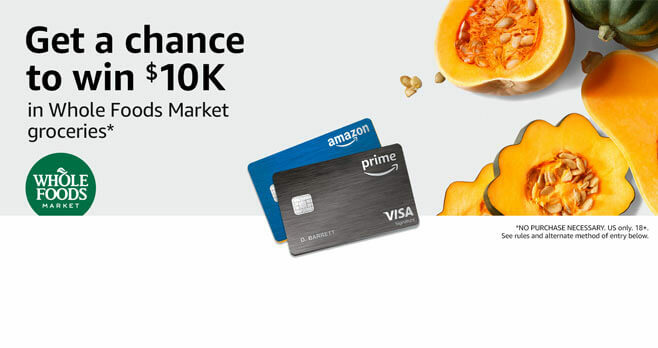 Use your Amazon Rewards Visa Card at Whole Foods Market by November 21 and get a chance to win $10K of groceries with this new Amazon Giveaway. Up to 20 lucky winners will receive $10,000 in Whole Foods Market gift cards for a total of $200,000 in prizes. Find all details and rules at amazon.com/amazonvisa. The Amazon Rewards Visa Card $10K of Groceries at Whole Foods Market Sweepstakes is open to legal residents of the 50 United States or the District of Columbia who are 18 years of age or older at the time of entry. The Sweepstakes begins at 12:00:01 a.m. (PT) on October 21, 2018 and ends at 11:59:59 p.m. (PT) on November 21, 2018. Limit of 30 entries total per person, who may only enter using one e-mail address and/or Amazon Rewards Visa Card account throughout the Sweepstakes Period, regardless of entry method. The grand prize consists of $10,000 in Whole Foods Market gift cards. Visit www.amazon.com/amazonvisa to enter and see Official Rules for details.